On the Under Armour website, there are eleven Under Armour shoes for girls available for purchase as current styles. Under Armour prides itself on developing a high quality, yet stylish and affordable shoe, the girls in your life are sure to love them. Girl’s Micro G Split grade school running shoe – available in black and silver with pink highlights, these shoes are great for comfort, traction, and moisture control. Girl’s Assert grade school running shoe – available in graphite with pink highlights, your girls will enjoy the cushioning and durability of these lightweight shoes. Girl’s Prophet III grade school running shoe – available in white and silver with pink highlihgts, as well as graphite and steel with coral highlights, these shoes will feel nicely fitted to your child’s feet, giving her added cushion, comfort, and breathability. Girl’s Reign grade school running shoe – available in belt blue and crystallize; eggplant and aluminum; and aluminum and metallic silver – these lightweight flexible shoes will keep her in maximum comfort, enhancing her natural footstrike. Girl’s Split infant running shoe – available in black and silver with pink highlights, these flexible and cushioned shoes will help your young runner going, keeping you on your toes after her. Girls’ Infant Assert running shoe – available in white and silver with turquoise accents, your young one will outrun the rest of them as these shoes giver her extra durability and traction. Your girls will enjoy these slides to take them from home to the game or their running activity – available in four different models: Girls’ Rally Slide II, Girl’s Playmaker III, Girl’s Rally Power II, Girl’s Mirabella II T. A variety of colors are available in the Playmaker and Mirabella models, so your girls can pick the ones that keep them in fashion and in comfort. Girl’s Split Preschool running shoe – available in black and silver with pink highlights, there’s no doubt your preschooler will be keeping her teacher busy, running in these flexible and comfortable shoes. Just because your girls are young doesn’t mean they don’t need a shoe that can perform and enhance their active lifestyle. More and more, young girls are encouraged to join athletic team sports and being encouraged to get active. 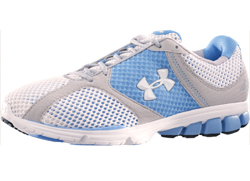 Under Armour shoes for girls are known for their comfort, which can help them endure through the most active regiments and team activities. At the same time, they are not sacrificing looks and style. Under Armour uses bright colors and modern styles to enhance the looks of their shoes for girls, which can even increase your daughter’s interest in wearing them and getting active. This will help make it easier when encouraging physical activity and team sports. Young girls need support and comfort, as well as durability to help them perform at their best. This will in turn help them feel confident and enjoy their activities even more.